If you live in an apartment building and walk through the hall at dinnertime, different scents may waft under the doors hinting at the scenes within. Maybe 3B is heating up leftovers, while 3C has had the slow cooker going all day. Meanwhile, the couple in 3D grabbed pizza on the way home, and 3E is unbagging the groceries that were just delivered to the doorstep, ready to tackle an elaborate dish recommended by a recipe app. Countless factors influence how (and how often) people cook: income, location, schedules, background, personal preference, and so on. Over the next decade, no one new gadget or device will suddenly make everyone in every kitchen start cooking the same way. Some baking enthusiasts will still make their bread in the oven and other people will grab a loaf at the grocery store, no matter how revolutionary a new bread maker might be. But the devices we use to cook are changing. From fridges that let you peek inside with an app to cooking scales that walk you through measuring out every ingredient, our kitchens are getting smarter, more connected, and more capable. The end result will be a kitchen that’s more personalized, catering to you and your family’s needs. In 1961, you could pick up Julia Child’s Mastering the Art of French Cooking, and learn to treat your kitchen as a place “where even failures tasted better … than packaged perfection,” as Laura Shapiro writes in Something from the Oven: Reinventing dinner in 1950s America. Plenty of people did, but others were also consulting Peg Bracken’s I Hate to Cook Book, published a year earlier, which gave advice like topping fruit with boiled custard “made according to the recipe in your big fat cookbook … Or you can use instant vanilla pudding in the same fashion.” Still others were scooping up forkfuls of brown rice and granola, meals that were “imbued with politics instead of romance,” according to Shapiro. The push and pull between convenience and quality, speed and nutrition is still around. 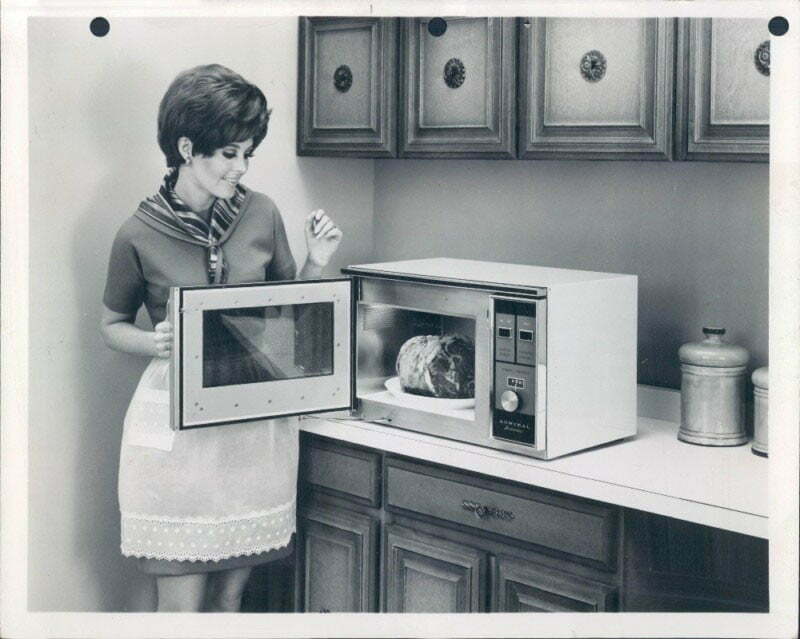 Decades ago, microwave manufacturers thought they’d solved the problem. “Almost overnight it became an appliance that was absolutely everywhere,” Shapiro tells Digital Trends. While the food industry scrambled to come up with products for the revolutionary device – from microwaveable milkshakes to hamburgers you could nuke – people figured out pretty quickly that the main thing they wanted to use it for was popcorn and leftovers. “It didn’t change cooking. It changed reheating,” says Shapiro. “There were some cookbooks that came out early on, in the ‘80s. Some of them, if you wanted to cook with your microwave, these were very serious, very good books. But nobody wanted to cook with their microwave. It was too different. It was too weird.” There was no sensory output like with an oven or stovetop: You couldn’t really see what was going on and smells were often fairly contained. The food processor is indeed helpful but perhaps not revolutionary, unless you make hummus or nut butter frequently. “That’s not something you hear very often when it comes to food and beverage consumption is the word ‘revolutionized, because we are typically very slow to change our behaviors in food and beverage consumption, because they are very habitual,” says Darren Seifer, an analyst with market research company NPD Group. Add to that the fact that appliances’ life cycles are far longer than cellphones’ and TVs’, and it seems obvious why your kitchen isn’t all that different from your grandparents’. In fact, unless you’ve remodeled recently, you may have a newish stand mixer that was a wedding gift, a fridge you replaced five years ago, and a stove that’s on its last legs. “There’s no such thing as a kitchen nowadays … Just freezer space, electronic cooking, automatic dishwashing. Life’s really simple nowadays — science has emancipated women right out of the kitchen.” Such was E.W. Williams’s 1950s vision of how the world would one day look – and cook. His “Frozen Foods 2000 A.D.: A Fantasy of the Future” was published in the Quick Frozen Foods Journal. Williams could have considered the microwave, that purveyor of five-minute meals, as the start of his prophecy foretold, but he would likely be dismayed to learn that the next range you buy will likely look pretty similar to the one currently in your kitchen. But what goes on inside the oven and on top of the stove could be a little different. Because the technology is so expensive to put in a large appliance, some of it is popping up in other places. “We’re seeing crossover between small and major appliances,” says Patrick Schiavone, vice president of Global Consumer Design at Whirlpool. “Countertop ovens have brought small ovens back to the forefront of cooking desirable food.” Cuisinart makes a steam-convection oven that sits on your counter and costs $300. No device better exemplifies this yearning for exact control than sous vide cookers. The myriad devices that clip onto pots of water and create a heated bath to within 0.01 degrees Fahrenheit are touted as not only practically foolproof but capable of delivering restaurant-quality meals – all this from a $200 appliance that fits in a drawer. Of course, you’ll still want your range to finish the job, in many cases. “Sous vide is not a magic bullet that’s meant to replace all your other cooking devices,” says López-Alt. He never wants to live in an oven-less house, but “the more tools we have at our disposal, the more ways we have getting to our final destination” of flawless food. Before Fannie Farmer came along, cookbooks suggested you add a handful of spice, measure out an egg-sized lump of butter, or roll dough into balls the size of a hazelnut. “Correct measurements are absolutely necessary to insure the best results,” Farmer insisted in The Boston Cooking-School Cook Book. She transformed measurements by changing teaspoons and measuring cup amounts from heaping to level. That changed the game in 1896, but the problem of overpacking measuring cups still lingers. Fortunately, modern scales are far more accurate, cheaper, and finally portable. A gram is a gram, and while recipes that list ingredients by weight are widespread, they aren’t yet universal. As scales get smarter and precision becomes a priority, it wouldn’t be surprising if more Americans started converting cups to ounces more frequently – or using an app or scale that does it for them. A scale could easily be integrated into countertops or tables in the future. Ikea has a vision of the kitchen in 2025 that includes a table with a built-in scale to ensure a recipe’s proportions are just right. The table also has a camera overhead as well as a projector, which beams down information, like menu or preparation suggestions, based on whatever’s happening below. Drop’s Connected Kitchen Scale wants to do much more than tell you how much your cup of flour weighs. In fact, it wants to talk to your whole kitchen. 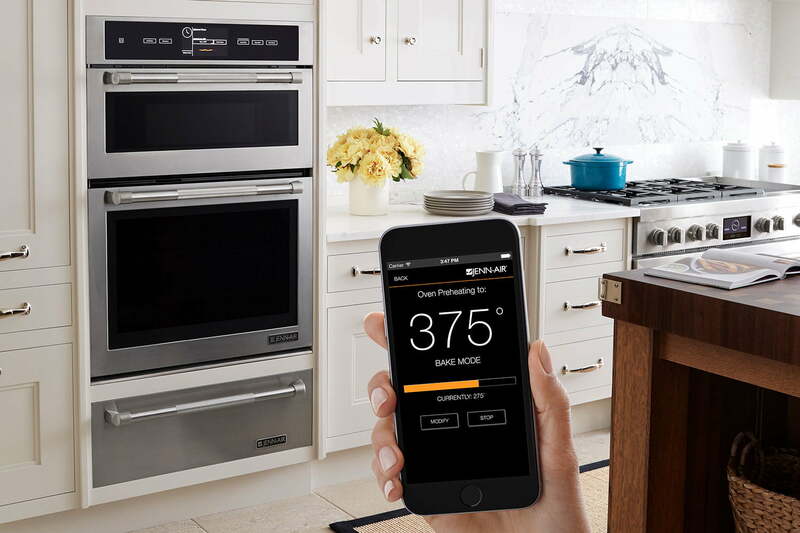 The company announced a partnership with Bosch Home Appliances this summer; when users get to the preheat step in a Drop recipe, those with an oven with Home Connect will get a notification on their phone that lets them click a button, which will tell the oven to set itself to the proper temperature. It’s a small but substantial step in the march toward the connected kitchen. Smart Jenn-Air ovens running Innit software now have recipes that can adjust to the weight and temperature of whatever food you’re cooking. “Every chicken is different, and every oven is different,” says Innit’s Kevin Brown. “We can actually download the perfect recipe for that piece of food and send a 14-step, Michelin star recipe directly to the oven.” When a gourmet chef makes chicken, he or she doesn’t set the oven to 350 degrees Fahrenheit and forget it. The temperature might start at a broil then get lowered, then raised multiple times. This method can cut the cooking time of ribs from 3.5 hours to 58 minutes, but that would be a tedious hour for a home cook. A connected oven could make all the adjustments for you. Adding Wi-Fi connectivity is relatively inexpensive, and Innit and Whirlpool plan on expanding these features – not just to other appliances, like fridges, but to models that aren’t as premium as Jenn-Air’s. “Our shared belief is this isn’t only a high-end feature; this is something that’s going to make it to every kitchen,” he says. Innit’s mission is to digitize food, says Brown, using cameras and sensors to recognize packaging and raw food. “Once you digitize and identify the food, that’s a straightforward way to get all sorts of information. That’s something we think people will really customize,” he says. If you’re following a low-sodium diet, you’ll be better able to track what you’ve consumed. Your fridge will be able to remind you about the broccoli you have hidden in the produce drawer before it goes bad. If you’ve made something with your Drop scale, you could weigh out the exact portion you’re about to eat and have all the nutritional information sync up with your fitness tracker. But if your appliances are all talking to each other, you should be able to horn in on the conversation. While the Amazon Echo’s speaker lets you ask Alexa to set a timer without pulling out your phone (and you can control GE’s connected appliances through voice commands), it doesn’t yet have a killer app that talks you through a recipe. You’d probably still want a screen to see, too, if you’re new to cooking and need to watch a video on folding egg whites into a batter. Maybe you’ll even be able to interact with a chef as you’re turning the bowl, and he or she will give you live tips on what you’re doing wrong. Recipe apps are already changing how people cook. “The younger generations are much more willing to accept advice from complete strangers on the internet,” says NPD’s Seifer. “So, it seems like, yes, our families are going to pass down traditions and recipes, but we’re also going to be introduced to a wider array of flavors and a wider array of methods and ideas, simply because we’re going to the internet for many more of our ideas.” While giving greater access, apps also allow for more personalization; you can filter out ingredients you hate or search for recipes that fit your pescatarian, nut-allergic diet. If your phone knows that much about what you eat, why shouldn’t your fridge and oven have the same information one day? Expanding beyond what Seifer calls your grandparents’ or parents’ “mental cookbook” invites in a whole world of recipes from far-flung countries. “I suddenly have access to information — and not just written information but videos, photos, and live-streams and all these things we didn’t have in the ‘90s or even early 2000s, and that’s definitely changed the way I cook. I think internet has changed cooking for the better,” says López-Alt. Of course, immigrants have always had an impact on the nation’s food. “That has just made such a difference in what an American grocery store looks like, what an American market looks like, what a garden looks like, what an American restaurant looks like,” says the Smithsonian’s Johnson. Widespread travel had a similar impact, she adds. Suddenly, people realized Europe’s bread, coffee, cheese, and chocolate tasted different from America’s. However, she does think her students are more mindful about what they eat. The same old thread of fast versus slow is alive and well: While some of her students are interested in “clean eating,” others are just waiting until they can live off a meal replacement like Soylent. Seifer agrees millennials are pickier about their food. “They’re more interested today than in the past about how the product got on the shelf and what happened before they got on the shelf, “ he says. It’s no wonder people are curious about what’s actually in our food when 20 percent of the fish we eat is mislabeled. It’s not the first time consumers have been obsessed with purity. In 1857, Mary Tyler Peabody Mann, wife of Horace Mann, longed for the day when there would be microscope in every grocer, or even every home, “to detect the adulterations of flour, sugar, farina, arrow-root, corn-starch, salt, [etc. ]” There was reason to worry: In 1887, poisonous chemical adulterants were reported in flour, spices, pickles, jams, baking powder, and so on, and the problem continued into the 20th century. Suggesting handheld molecular scanners will be found in every pocket 10 years from now seems a bit too Mann-ish, but perhaps incidents like the fish fraud will push people toward meat alternatives. While you can’t actually cook many of the recipes in The In Vitro Meat Cookbook yet – good luck finding a bird for the dodo nuggets – it does hint at a future where “painless foie gras” might be possible. “It’s so resource-intensive to raise meat, at some point we’re going to have a solution to this problem. Meat consumption is not going down,” says López-Alt. The scientists at Beyond Meat are trying to understand meat at a molecular level, says the company’s marketing director, Will Schafer. “We see it as a composition of basic biological building blocks and not about where meat comes from in origin. People love meat, and we don’t think that’s going to change.” The company thinks it’s come close to perfecting its Beyond Burger, a plant-based substitute Schafer says wouldn’t be out of place at your next barbecue: It even “bleeds” beet juice. “It isn’t about sacrifice. It has that taste and texture but without the downsides,” he says – the downsides being environmental impact, health concerns, sustainability, and animal welfare. While Beyond Meat is currently focused on its current lineup of products, it wants to eventually apply the same scientific scrutiny to pork, bacon, and seafood. The true crowning achievement of the Beyond Burger, says Schafer, is that you can actually find it in the meat container next to real beef. That might be strange, but nowadays it’s entirely natural to find almond and soy milk next to the real McCoy. What about growing it yourself? Though smart, supposedly foolproof indoor gardens have been popping up on Kickstarter, they might not be the way the majority of people get their produce 10 years from now. Not only do they require time and attention, it means you’ll have to learn 17 different zucchini dishes. “For someone who’s looking up every single recipe to cook, it doesn’t save work, it actually adds work to be forced to use a specific ingredient repeatedly,” López-Alt points out. In the early 1980s, food writer Elizabeth David was dining with Julia Child when the famed chef noted the restaurant was serving “Cuisinart cooking.” Over half the restaurant’s menu couldn’t have been made without the food processor, and Bee Wilson writes in Consider the Fork that it wasn’t long before chunky soups had a sort of anti-Cuisinart resurgence. As technology creeps further into the kitchen, we could see something similar – even greater worship of the low-tech grill, for example (though maybe with a lab-grown burger sizzling over the coals? ).